James Sayers (1748-1823), The Comet, 18 February 1789. Etching and aquatint. Published by Thomas Cornell, London. Graphic Arts Collection GA2013- in process. 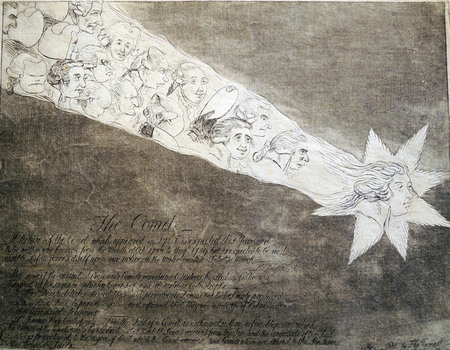 Originally trained as an attorney, James Sayers (active 1748-1825) drew the first British caricature using the symbolism of a comet (later copied many times). His print was released on February 18, 1789, the day before the scheduled third reading of the Regency Bill, which would take power away from George III (1738-1820). Happily, the King’s porphyria had begun to recede in January and by early February, various politicians were leaving Charles Fox (1749-1806), and returning to the side of King George and William Pitt (1759-1806). Sayers’s comet is headed by the Prince of Wales, a possible allusion to Louis XIV, the Sun King. Here, it is George III who is the unseen sun. Riding on the tail of the Prince are Richard Brinsley Sheridan; Fox; William, 3rd Duke of Portland; Sir Grey Cooper; John Warren, and several others.